Soldiers who served in the Confederate States Army fought on behalf of the Confederate States of America. 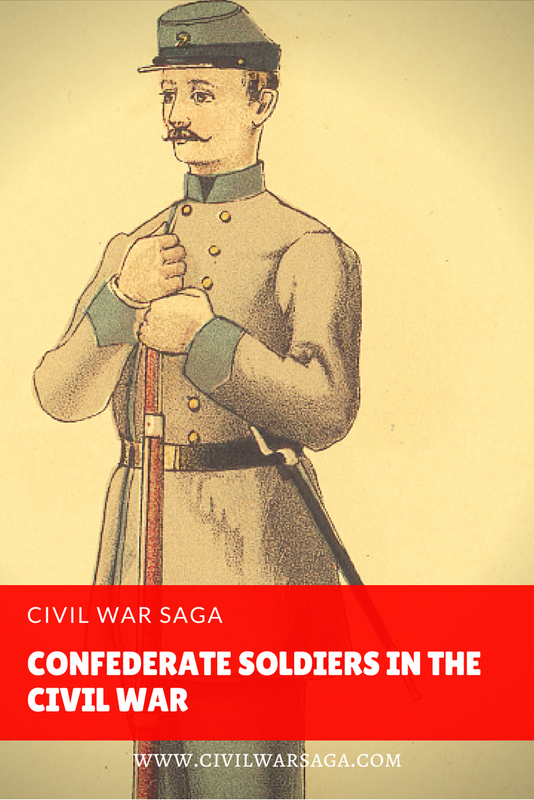 These Confederate soldiers were from the 11 states that had seceded from the United States of America and joined the Confederate States of America. They tended to be young southern farmers, laborers and mechanics. Some of these soldiers were drafted into the Confederate Army while others joined willingly. How Many Confederate Soldiers Served in the Confederate Army? According to the Oxford Companion to American Military History, the best estimate of total Confederate soldiers range from 850,000 to 900,000. How Much Were Confederate Soldiers Paid? Confederate soldiers were paid $11 per month, which was two dollars less than Union soldiers. They were paid in Confederate currency. The types of uniforms Confederate soldiers wore consisted of a double-breasted gray frock coat, a pair of light “french blue” trousers, white cotton shirts, a forage cap and leather brogan shoes. How Old Were Confederate Soldiers? The majority of Confederate soldiers were under 30 years of age. The age range of the Confederate Army’s First Conscription Act in 1862 was 18 to 35 but the Third Conscription Act in 1864 changed it to 17 to 50. Where Were Most of the Confederate Soldiers From? The precise number of Confederate soldiers from each state is unknown because many military records were destroyed when Richmond was evacuated in 1865. How Many Confederate Soldiers Deserted or Were Killed? It is estimated that over 100,000 Confederate soldiers deserted during the war, more than 250,000 died of wounds or disease and 200,000 were wounded. What Did Confederate Soldiers Do Before the Civil War? What Jobs Did Confederate Soldiers Do in the Confederate Army? Why Did Confederate Soldiers Fight in the Civil War? According to Civil War historian James M. McPherson, in his book For Cause and Comrades, most Confederate volunteers stated they were fighting for liberty as well as slavery while many of the Union soldiers stated they fought to end slavery and preserve the union. What Were Confederate Soldier’s Nicknames? Why Were Confederate Soldiers Called “Rebels”? For more information about soldiers in the war, check out the following article on Civil War soldiers. McKim, Randolph A. The Numerical Strength of the Confederate Army. Neal Publishing Company, 1912. McPherson, James M. For Cause and Comrades: Why Men Fought in the Civil War. Oxford University Press, 1997. Larned, Josephus Nelson. The New Larned History for Ready Reference, Reading, and Research. Vol 2, C.A. Nichols Publishing Co, 1922. Lanser, Amanda. Civil War By The Numbers. Capstone Press, 2016.
so grateful for this information… I know my family fought with the Confederates during the Civil War and am just trying to find out about family history… and my country’s history… thanks from a curious mind!